There are three main anthropogenic factors that pose a serious threat to European wildlife. These are causing the death of individuals by illegal poisoning, poaching, trapping or trading, reduced reproductive success due to habitat disturbance and habitat loss due to e.g. deforestation or wetland filling. Deliberate poisoning has been documented as one of the most severe factors threathening wildlife and biodiversity conservation in Europe. In Austria poisoning currently plays a major role in the loss of dozens of bird species and is the main cause of death for the White-tailed eagle. The most common methods of poisoning wildlife can be grouped into two main categories: poisoning with chemicals and lead poisoning. Chemicals can be permitted, but pesticides such as non-selective insecticides and rodenticides are often misused. In this case poisoning aims to target e.g. rodents, however, after consuming poisoned prey it weakens the predator or may have lethal effects due to the accumulation of the poisoning agent. The other group consists of the use of non-permitted, banned poisons, such as the EU-wide banned pesticide Carbofuran. This is one of the most toxic pesticides on the market. It has a high number of leaching into groundwater, a high mammalian and avian toxicity and a low potential for bioaccumulation. No wonder it is not approved for use in the EU. On the other hand, to this day it is a commonly used poison against wildlife and together with other toxic chemicals, their consequences on the environment and wildlife are severe. Lead poisoning is another possible threathening factor mainly on birds of prey, which are scavenging the carcasses left in the field by hunters. Consumed lead accumulates in the bones and weakens the individual. Unfortunately this is not a one of a kind case. 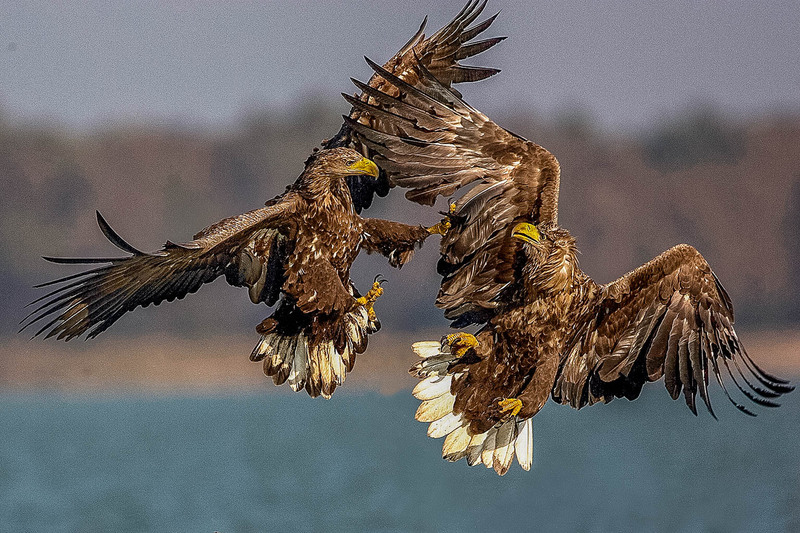 Since September 2018, Austria lost 8 of its White-tailed eagles due to anthropogenic factors. 4 were subjects of poisoning, one was trapped and then killed, 2 collided with wind turbines and one collided with a train. Recently a poisoned White-tailed eagle was found in Lower Austria. This individual was one of the 35 adult female White-tailed eagles breeding in Austria. Apart from this species, in the last years many Red kites, Buzzards, ravens, as well as foxes and martens have become victims of the growing amount of poisoned baits layed out against predators in the country. Moreover, calculated with the individuals not found due to various reasons, any number published is just the tip of the iceberg, representing a small percentage of the total number of all illegal activities. White-tailed eagle in Europe’s largest eagle. It was extinct in Austria with only a few wintering individuals in the 1970s. Starting with the first proven breeding documented in 2001, it had a triumphant return. During the last counting 35 breeding pairs were found in total, however, counting with only 70 individuals, losing each bird is a great loss, not to mention losing 8 in a matter of few months. Bearded Vulture eats only carcass, which is often poisoned with lead. One of the most successful reintroduction programmes of the bearded vulture supported with significant funding in the National Park Hohe Tauern has also been paused after 32 years. Many vultures suffered from lead poisoning causing a significant drop in the reproduction rate threading the long term success of their long-term survival in the Alps. Amazing fact here also is, that the reintroduction is more successful in every other location than in Austria, where more vultures die of human influence than anywhere else. The authorities lost Vultures due to lead poisoning already back in 2012. Poisoned baits are, despite being banned by the Birds and Habitats Directive and the Bern Convention of European Wildlife and Natural Habitats, actively used across Europe to kill predators. This pattern exists since years, and delays in addressing these cases is a serious concern. In the last years, many national and cross-border initiatives emerged to bring together responsible sectors in tackling this issue. Some examples include the Balkan Anti-poisoning project and the LIFE project LIFE Against bird crimes. Raising awareness and public involvement is a key element to tackle this threath. That’s why WWF Austria had set up the “Vorsicht – Gift” (Beware, poison) hotline in 2003. This is maintained in cooperation with the Lower Austrian Hunting Association. National initiatives like Spain’s Veneno project, running from 2010 to 2014 have built up a Network of Volunteers against Poisoning. There is still much to learn about the sheer extent of these poisoning practices. However, the increasing frequency and widespread distribution of illegal poisoning must draw immediate attention among decision makers. Wilderness requires zero-tolerance towards illegal killing. Adopting this will need coordinated and integrated efforts. This means the engagement of stakeholders as well as relevant governmental authorities and enforcement agencies to improve law enforcement at EU as well as national level. Federation Coalition Natura 2000: Romanian Government threatens Protected Areas!